At the time of its inception Walt Disney World stretched out for approximately 30,000 acres. The comparison has always been that the resort is the same size as San Francisco or twice the size of the island of Manhattan, which much of this land still being undeveloped. Yet when the Vacation Kingdom opened it was not nearly as expansive as we currently think of the area, regardless of how much land Disney had at its disposal. In fact, in 1973, this was the entirety of Walt Disney World. The iconography of those early years, stretching out into the early 1980s, has always spoken to me. The Osceola –class paddlewheel, Ports-O-Call, sitting out in Bay Lake and it’s home dock of World Cruise Landing set the stage of waterway adventures. Meanwhile the barn of Tri Circle-D, campers, and the inhabitants of Treasure Island complete the Bay Lake story and beckon in the eye and guests. Of course, the prominent feature of Cinderella Castle is front and center, but the inclusion of the Magic Kingdom monorail station is a great touch. Above all though, the single greatest element of this map is the Walt Disney World compass. 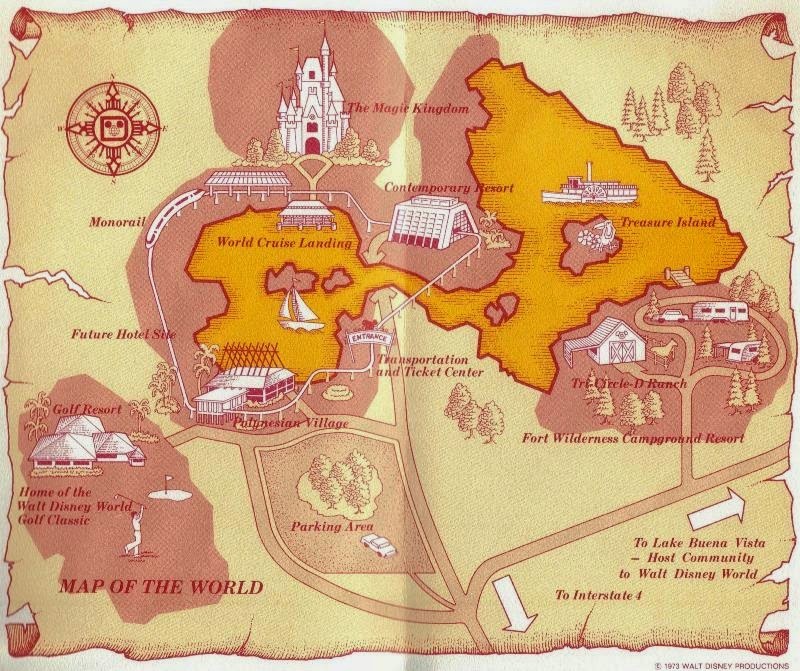 Keen eyes will also note that the map includes references to the Walt Disney World Golf Classic and a future hotel site, a dream for an Asian resort that was meant to be but never came to pass. There’s so much that we learn from the early years of Walt Disney World, looking back often provides the best guide to what the future may look like. With the maps we get a chance to see just how spacious the entire resort was, even if the amount of land far surpassed that which guests could actually set foot upon. There are plenty of memories to take away from this map, the things that have changed and the adventures that are no longer available. So back then did people just stay at disney for a couple of days? I can't imagine staying for a week.